Have you ever had the situation that you wanted to do something with Lightroom which is not within the standard scope of the application ? Think about including metadata in the image (e.g. ISO and shutter speed, aperture) or the date you took the photo. Or did you ever want to create a border around the images ? 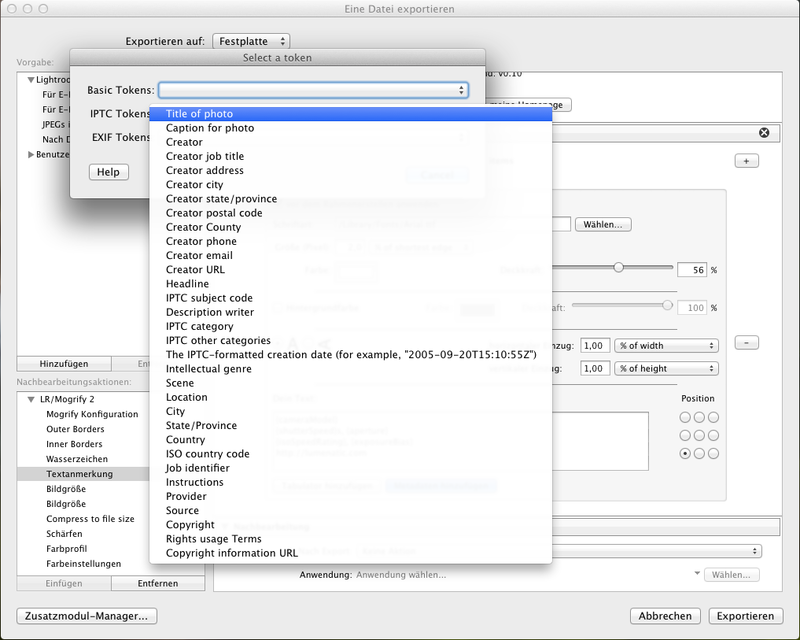 Well, these are very simple tasks but Lightroom (in its current version 5.6) does not offer them. But there is a plugin which can help ! Move LR2Mogrify.lrplugin to a convenient location of your own choosing. Browse to the plugin and click “OK” on a Mac or “Add plugin” on a PC. sharpness, color profile, color settings (=saturation and brightness, also not clear why the tool offers that). 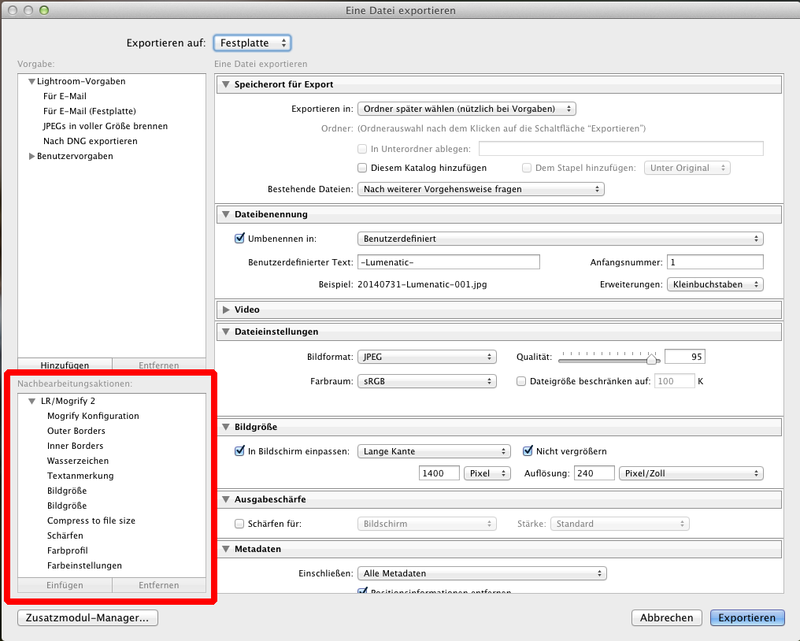 To apply one of those settings to your export simply highlight the option and click “add” (“Einfügen” in my German version, jawohl). The chosen option is then added as a fold-out tab on the right side of the dialogue. The options are implemented in a very practical way. The border size for example can be given in pixels or as a percentage of the height, width, short or long image border. Same applies to the text annotations. To create the text annotations (which were the reason for acquiring LR/Mogrify 2) you can choose from an abundance of metadata, here is an example. Everything you might want to include into an image can be chosen here. 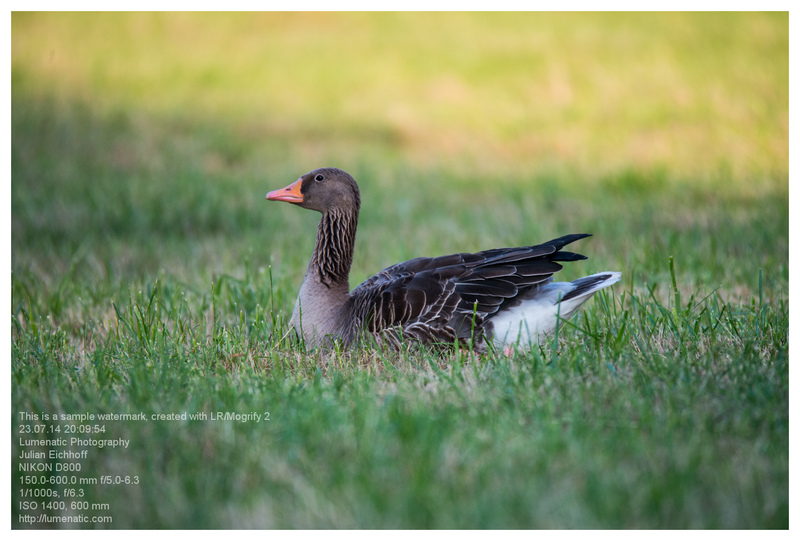 Bottom line: I found LR/Mogrify 2 to be a very versatile and practical tool. It adds some simple but sometimes necessary functions to Lightroom. Highly recommended for Lightroom users. Donate what you feel the tool is worth – it’s up to you.